Nathan Horton's goal proved to be the difference in Game 7 of the Bruins-Lightning contest. 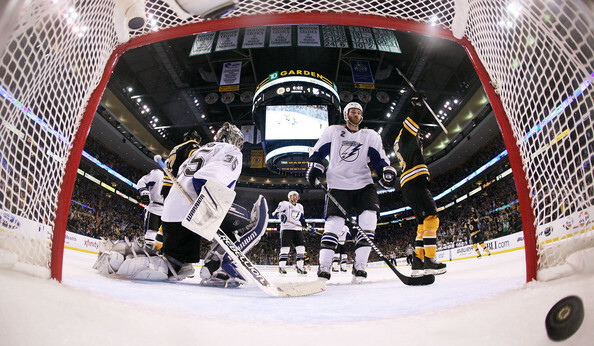 The Boston Bruins and Tampa Bay Lightning met in Game 7 of the Eastern Conference Finals at TD Garden and it was a battle of the goalies, as Dwayne Roloson and Tim Thomas put on a show for the fans. The first period featured several scoring chances for the Bruins, yet, Roloson stopped 14 -shots. Nathan Horton missed the last seven minutes of the first period with a leg injury, but did return. The Lightning lost Steven Stamkos when Johnny Boychuk’s shot hit him in the nose. Stamkos returned later in the period with a cage similar to the one Chris Kelly wore in first round of the playoffs against the Montreal Canadiens. The Bruins picked up pace in the second period, but couldn’t get anything past Roloson. Although, the Bruins did eventually beat the 1-3-1 zone, as Horton scored on a David Krejci pass with 7:32 left in the third period to break the scoreless tie and give Boston a 1-0 win. Tim Thomas stopped 24 shots, as well as recorded his second shutout of the series. Boston will now advance to the Stanley Cup Finals for the first time in 21-years against the Vancouver Canucks next Wednesday in British Columbia.